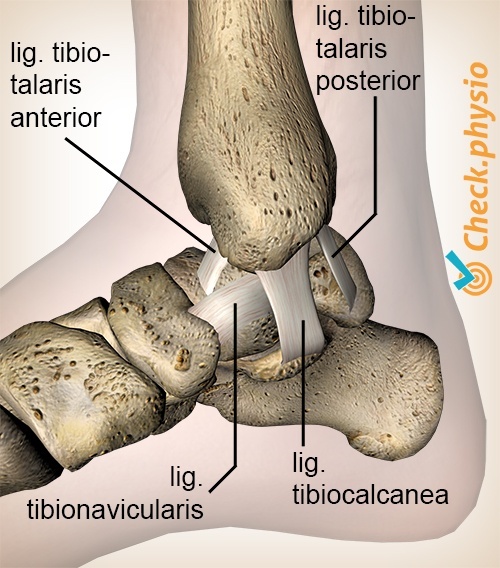 The medial ankle ligaments are sturdy structures on the inside of the ankle joint. They prevent the foot from rotating too far outwards with respect to the lower leg. Torn medial ankle ligaments result in pain and instability to the inside of the ankle joint. Injury to the medial ankle ligaments is fairly rare. 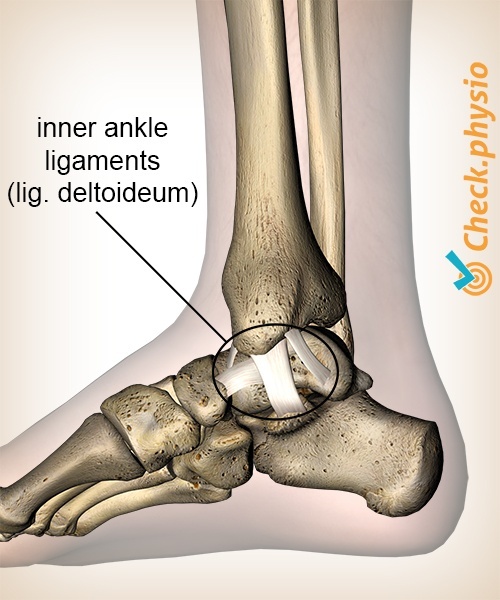 Usually, the lateral ankle ligaments are the ones that tear when we sprain an ankle. The medial ankle ligaments form part of the "deltoid ligament". This is a very sturdy ligament structures consisting of 4 components. These ligaments are stretched when the foot is rotated too far outwards (eversion). If the force with which this takes place is too great, the ankle ligaments will be damaged. In severe cases the ligaments can rupture. In most cases only a few fibres or parts of the deltoid ligament will be damaged. The classic way in which the medial ankle ligaments are damaged is the "eversion trauma". This means that an accident or fall causes the foot to rotate outwards under excessive force. For example, when someone missteps or when an external force acts on the ankle to sprain it, as can happen in contact sports such as football. Prolonged overloading of the medial ankle ligaments can also cause pain. If the ankle ligaments are stretched repeatedly during sports, they can eventually cause symptoms. Examples include sports that involve repetitive short and quick changes of direction such as football, basketball and volleyball. 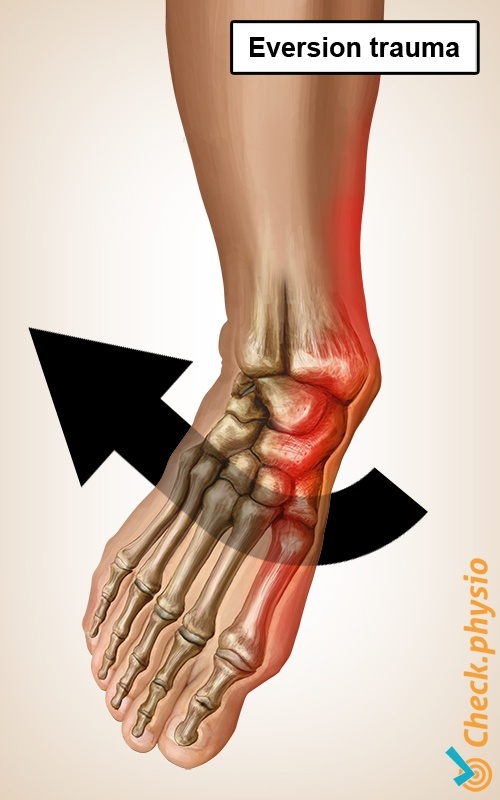 The passive outward rotation of the foot (eversion) stretches the damaged ankle ligaments and causes pain. Pressure on the medial ankle ligaments is painful. Feeling of instability (for example when walking downhill, walking down stairs or walking on uneven surfaces). The ankle can be swollen and bruised (internal bleeding). Treatment depends on the severity of the injury. Physiotherapy is aimed at improving the stability of the ankle by facilitating optimum recovery of the ankle ligaments and training the muscles to take over some of the stability. Surgical reconstruction can be considered if the ankle ligaments have ruptured completely. Treatment can take up to 3 to 6 weeks if no complications arise. In more severe cases, the recovery can take several months to more than a year. Hintermann, B. (2003). Medial ankle instability. Foot Ankle Clin N Am. 2003;8:723-738.